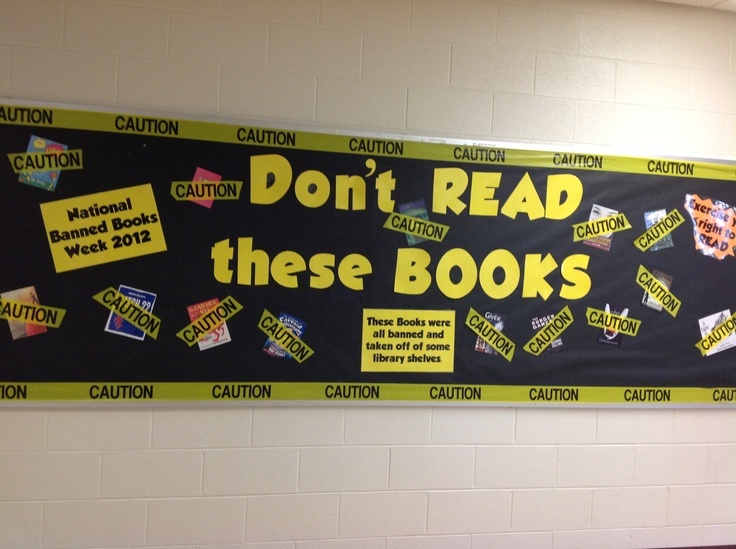 Banned Books Week: Virtual Read-Out, Bulletin Boards, Reading Signs, Oh my! Banned Books Week is coming September 27th-October 3rd! What to do . . . What to do . . . What to do . . .
1) You can submit a video no more than 3 minutes long of a reading from a banned or challenged book. The video should include information on where and why the book was banned or challenged. You may also add a comment about why you believe the book is important. Please keep your remarks brief. 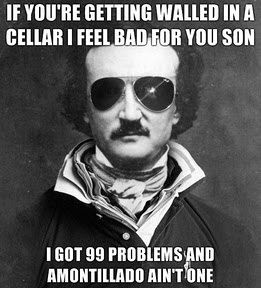 Here is a list of banned literary classics as well as a list of frequently challenged books throughout the years. You should also check out Mapping Censorship and Robert P. Doyle’s Banned Books: Challenging Our Freedom to Read for more ideas. Banned Books: Challenging our Freedom to Read is available for purchase at the ALA Store or can be found at your local public library. 3) A video of an eyewitness account of local challenges can be submitted. This video should be no longer than three minutes long. 4) Create a promotional video for Banned Books Week like the videos featured here. The video should be no longer than five minutes long. The video’s message should focus on celebrating the freedom to read during Banned Books Week. This information is also available here (the link also explains how to submit a video, which is important). You can complete and submit these videos any time of year, so, for example, if you made a “banned books” a theme for independent reading, it could be some kind of assessment grade or an option students could choose for assessment (under these criteria, it would have to be in the quiz or homework/classwork category) that still assesses, to some extent, whether or not they read the book and allows students to contribute to a larger reading community. Or, if a student reads a banned book anytime throughout the year, this could be a form of assessment. I think 2 and 4 could be independent-reading assessments, whereas option 1 could be a pre or during-reading assignment. Of course, you could also do this (to show them or model a “book talk” of sorts” or your class could create one together if you read a whole-class novel that is on the banned books list. A third option, if you read a banned book as a whole-class novel, would be to have students work individually or in pairs and “compete” for best video. The winners could have their videos uploaded to the site. This link will take you to youtube videos others have created. These could serve as book talks you show your kids either as models OR to get them interested in reading those books! It could also be a great foray into a discussion about censorship. 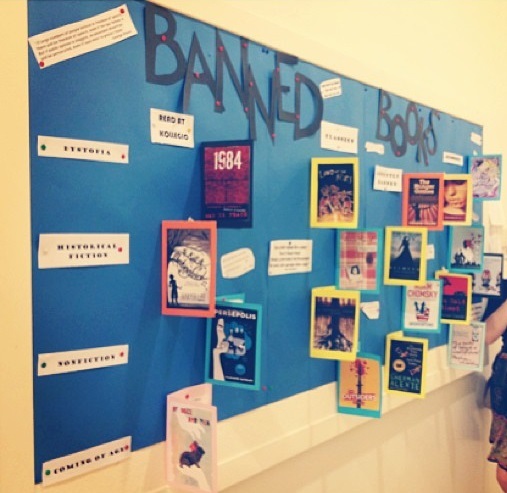 Banned Book Bulletin Boards – Want help putting one together? Let me know! 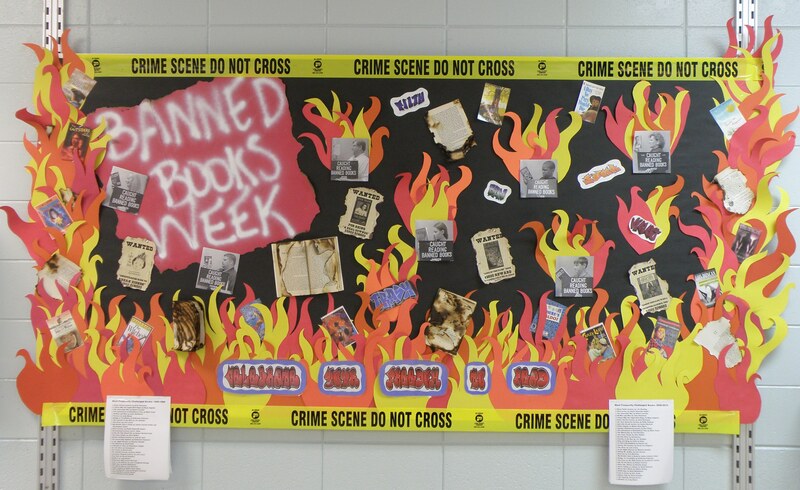 Banned books can make a great bulletin board theme or even a “display” for the top of your classroom-library bookshelf. This bulletin board has “wrapped books” with descriptions of why it was challenged on the outside. I think it would definitely draw in student interest and later in the year or throughout the year, you could reveal the books. This one has book covers and titles, and I don’t know what’s “inside” the book cover, but putting descriptions of the book or reasons why it was challenged would be great! 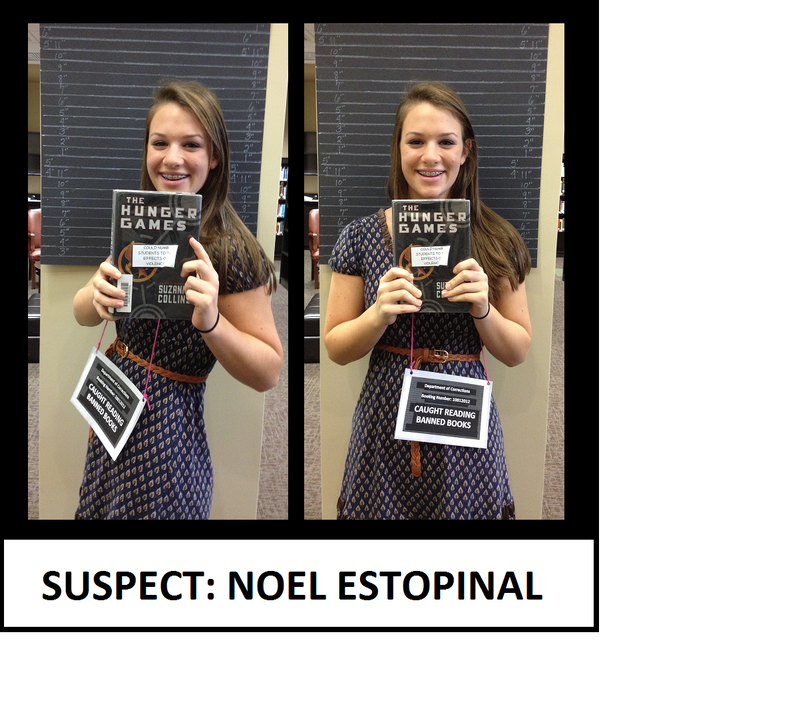 I’ve seen pictures like these compiled on a bulletin board that says “Busted for Reading Banned Books.” You could have students pose with banned/challenged books (like The Outsiders) that they’ve already read and/or add to it throughout the year as students pick banned books for independent reading. There is a banned book themed reading promotion sign that you can personalize to your favorite banned books (and with your name) in the District Shared Directory – English – Reading Signs & Templates. Here’s a list of banned books to help you along the way! And I created a new, more generic one that might work for you too (it’s on the shared directory in full size and resolution). I tried to use titles we teach, have in our classroom libraries, or offer as summer reading. Why the Best Kids Books are Written in Blood: Sherman Alexie’s brilliant response to the challenges of his book, The Absolutely True Diary of Part-Time Indian. The #bannedbooksweek hashtag and @BannedBooksWeek on Twitter. I thought this could be a great mini-assessment/fun idea for a “reading check” or to review short stories or share independent reading titles — have students create memes for the stories they’re reading! Printing them out and putting them on the wall or a bulletin board would make for some great décor. 🙂 Plus, it’s a visual way to share texts to read and/or remind students what they’ve read!